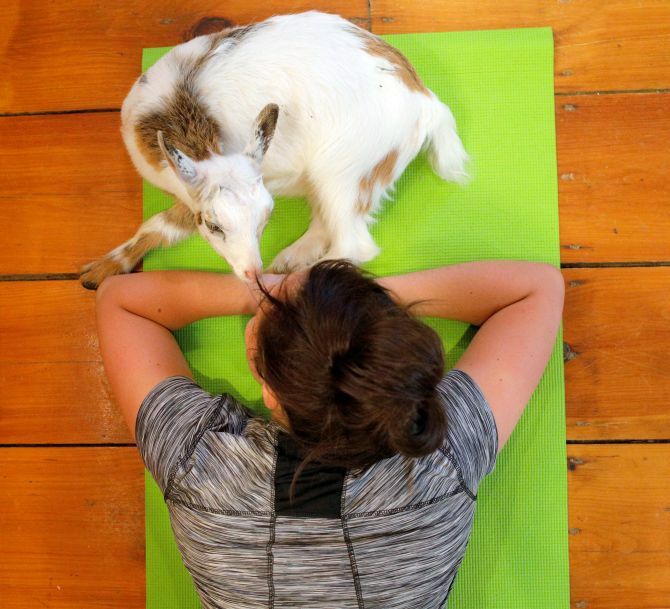 Rediff.com » News » Would you try 'Goat Yoga'? We have all heard of hot yoga, power yoga. 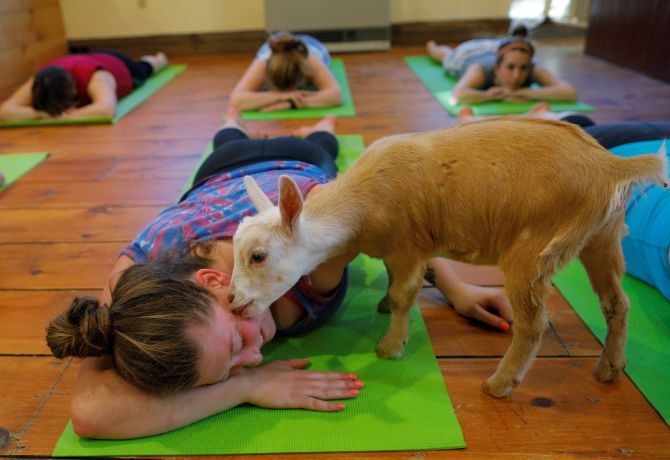 But how many of you have heard of goat yoga? 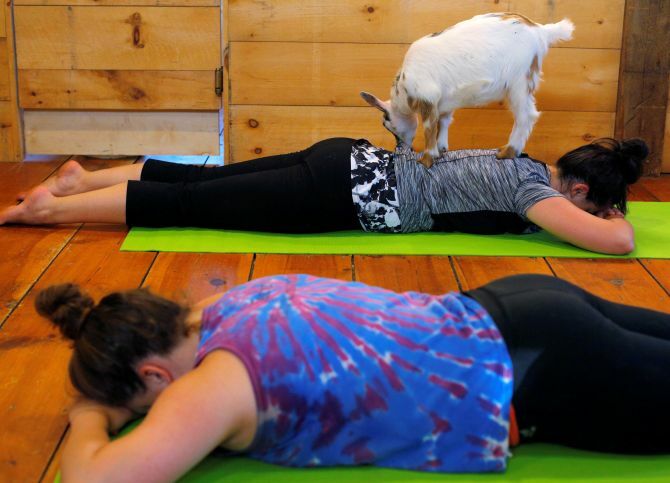 Goat Yoga is real and, believe it or not, is a big craze in the United States with classes selling out everywhere from California to New York. Ahead of International Yoga Day, which is on June 21, here are some images that will make you believe! This new craze which has spread like wildfire in the United States involve Nigerian Dwarf goats -- miniature goats of West African origin -- roaming about as yogis practice their exercise routines. According to the practitioners of this new trend, the animals never fail to delight and the goats bring in a lighter and more joyful energy to a class, bringing everyone together. Participants are invited to spread out their yoga mats and the animals wander through and come close for a nuzzle. Sometimes, the baby goats will climb into participants’ laps, or jump up on their backs. Many of the times, the yogis leave their asanas and engage with the pets, which some might not be very happy about, but most practitioners say that their groups are happy. The visionary behind the trend believes that goat yoga is not merely fun, but has true therapeutic benefits. It sounds fun, but we wonder if we would like animals crawling all over us while we did the Padmasana or the Shravasana. 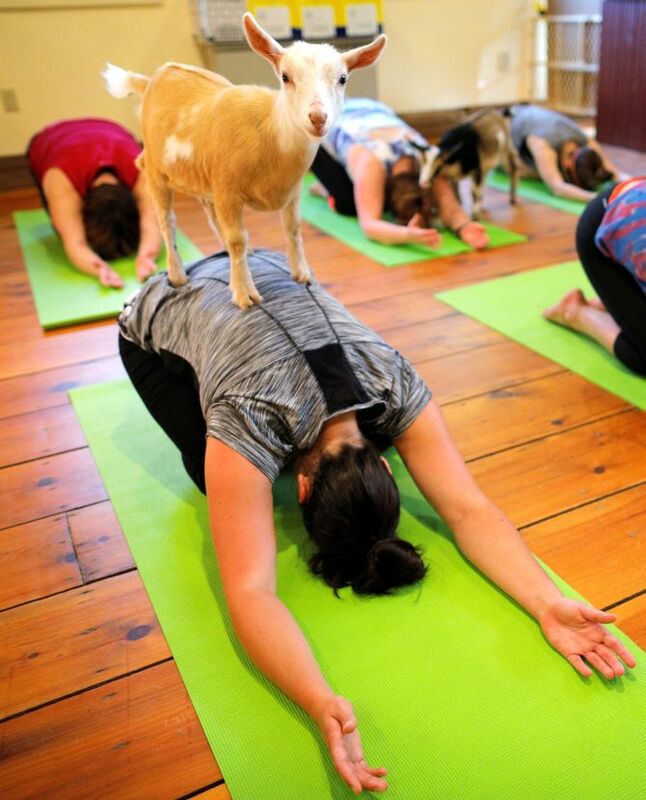 So, readers, you tell us in the comments below, would you try Goat Yoga?